Many therapeutic HIFU applications rely on heat generation in the tissues proximate the focal region due to absorption of a portion of the acoustic energy delivered to the focal region. HIFU therapy can quite rapidly produce temperatures in tissue of up to 100 C, causing coagulative tissue necrosis within a few seconds. Focusing results in high intensities at a specific location and over only a small volume (e.g., a cylindrical volume of about 1 mm diameter and 9 mm length, although the exact size of the focal region depends on the transducer design). Focusing the energy avoids damaging tissue located between the transducer and the focal point, because the acoustical energy intensities are much lower outside of the focal region. The depth and width of the focus of HIFU can be adjusted based on the physical design of the transducer and the operating frequency. By changing the frequency, radius of curvature, and diameter of the transducer, the dimensions of the focus can be manipulated to provide the optimal geometry for treating various treatment sites. Therefore, a transducer can be designed for applications ranging from superficial treatment sites to tissue deep within tissue. HIFU can be used in connection with ultrasound imaging, as described in U.S. Pat. No. 6,425,867, the specification and drawings of which are hereby specifically incorporated herein by reference, such that the location of the focal region can be identified using imaging ultrasound, and the HIFU therapy delivered to the desired target location. Several different types of acoustic couplings are known. Acoustic viscous coupling gels can be smeared over the distal end of the probe and on the patient's skin (or tissue layer in a body cavity) to facilitate acoustic coupling. Water is an excellent acoustic coupling medium, and water filled balloons or bladders are often disposed between an acoustic transducer and the skin layer to facilitate acoustic coupling. While the use of aqueous filled membranes is well known, there are some disadvantages to using aqueous filled membranes for acoustic coupling. These disadvantages include a requirement for degassing the aqueous solution (the presence of gas bubbles will significantly impede transmission of the ultrasound waves), sterilization concerns, and containment issues. Hydrogels are solids having a particularly high water content, and are efficient coupling media for diagnostic ultrasound. Hydrogels are hydrophilic, cross-linked, polymer networks that become swollen by absorption of water. The high water content and favorable mechanical properties of hydrogels have made them attractive for a wide range of biomedical applications, including soft contact lenses, maxillofacial reconstruction, bum dressings, and artificial tendons. Since hydrogels consist mostly of water, they inherently have low attenuation and acoustic impedance similar to tissue. They can be formed into rigid shapes and have relatively low material costs. Unlike the ultrasound transmission gels typically used for diagnostic scans, hydrogels can have consistencies similar to soft rubber, and can be formed into relatively rigid, 3D shapes. In one preferred embodiment of the present invention, acoustic coupling 80 is thus implemented using a hydrogel. It should be understood, however, that acoustic coupling 80 can also be implemented using a viscous ultrasound transmission gel or an aqueous-filled membrane. Seven New Zealand white rabbits were used for an empirical study directed toward confirming that selective occlusion of blood vessels in accord with the present invention could be achieved in an animal model. The transducer employed has been described above. The ultrasound activatable agent employed was Optison® (Amersham Health, Princeton, N.J.), a commercially available ultrasound contrast agent. The ultrasound exposure conditions employed are as follows: 1.17 MHz frequency, 9 MPa peak negative pressure, 5000 cycle pulse, 1 Hz PRF, and 0.43% duty factor. The peak positive and negative pressures applied in this study were +27 and −9 MPa respectively, corresponding to a ISPPA of approximately 5300 Watts/claim−2. The spatial peak-temporal average intensity (ISPTA), for a 0.43% duty factor, was approximately 23 Watts/cm−2. Targeted vessels were exposed at two sites located 4 mm apart for 60 seconds each. In each animal three (3) vessel segments were targeted for treatment, two of those segments corresponding to control treatments. The three types of treatments included: 1) an injection of fibrinogen only (no ultrasound, no ultrasound contrast agent); 2) an injection of the ultrasound contrast agent (0.5 ml of Optison®) followed by ultrasound exposure, without a subsequent fibrinogen injection; and 3) an injection of the ultrasound contrast agent followed by ultrasound exposure, followed by a fibrinogen injection (up to 0.2 cc of fibrinogen). The results of the treatment arm and control arms are given in Table 1. 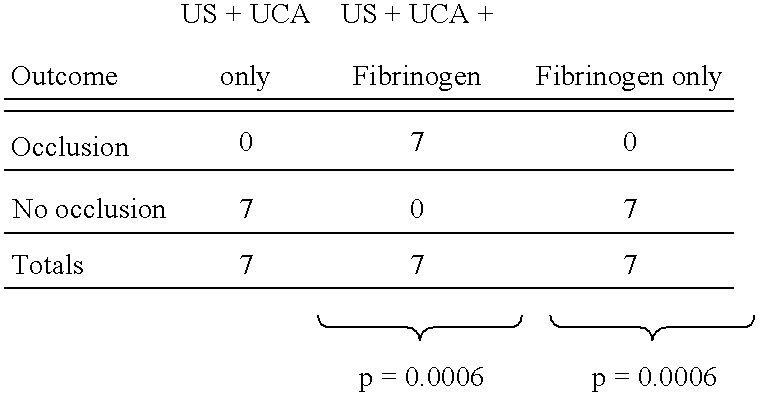 Acute vascular occlusion occurred in all 7 vessels treated with ultrasound in the presence of ultrasound contrast agents, followed by an intravascular injection of fibrinogen. Vascular occlusion was demonstrated by the absence of venous flow using Doppler evaluation of the treated segment. Injection of Evan's blue dye confirmed vessel occlusion with redistribution of flow. Vessels that were injected with fibrinogen, but not targeted with ultrasound, did not occlude with the injection of fibrinogen. Furthermore, no acute systemic reactions occurred as a result of fibrinogen injection. Vessels that were targeted with ultrasound after injection of an ultrasound contrast agent, but were not injected with fibrinogen, did not demonstrate any evidence of vessel occlusion. The p-values in comparing the difference in outcomes between the treatment arm and either of the control arms were p=0.0006 each. Survival studies demonstrate that the vessel occlusion is not durable over 14 days. This is not an unexpected result. The biologic response to an occlusive thrombus is to reestablish normal blood flow. In the case of clots primarily consisting of fibrin, the local activation of the fibrinolytic system regulates the extent of intravascular thrombus formation and its degradation. Prior art techniques that have resulted in the successful long-term occlusion of vessels generally involves a greater degrees of injury to the vessel and perivascular tissue, leading to intense inflammation which is known to promote clot stability. The primary mechanism by which inflammation promotes clot stability is thought to be due to interleukin-l release from inflammatory cells resulting in up regulation of plasminogen activator inhibitor synthesis by endothelial cells which results in down regulation of fibrinolytic activity. The histology of ultrasound treated vessels in this empirical study indicates that such an intense inflammatory response does not occur as a result of ultrasound treatment. Therefore, in order to obtain a durable vascular occlusion, an additional agent that elicits an intense local inflammatory response, such as absolute alcohol, will likely be required. Thus, one aspect of the present invention encompasses the additional step of introducing an inflammatory agent, such as absolute alcohol, to promote long-term clot stability. (b) damaging endothelial cells proximate the target location, such that a fibrin clot develops proximate to the damaged endothelial cells, thereby at least partially occluding blood flow in the blood vessel. 2. The method of claim 1, wherein the fibrin clot is insufficient to provide a desired degree of occlusion, further comprising the step of introducing fibrinogen into the blood vessel, such that the fibrinogen is converted to a fibrin proximate to the damaged endothelial cells, thereby enlarging the fibrin clot and occluding blood flow in the blood vessel to a greater degree. 3. The method of claim 2, wherein the step of introducing fibrinogen into the blood vessel comprises the step of introducing fibrinogen proximate to the target location. 4. The method of claim 2, wherein the step of introducing fibrinogen into the blood vessel comprises the step of introducing fibrinogen systemically. 5. The method of claim 1, wherein the fibrin clot is insufficient to provide a desired degree of occlusion, further comprising the step of introducing thrombin into the blood vessel, thereby enlarging the fibrin clot and occluding blood flow in the blood vessel to a greater degree. 6. The method of claim 1, wherein the step of selecting a target location in the blood vessel comprises the step of selecting a plurality of target locations generally distributed about the circumference of the blood vessel, and wherein the step of damaging endothelial cells proximate the target location comprises the step of damaging endothelial cells at the plurality of target locations generally distributed about the circumference of the blood vessel, such that the fibrin clot expands inwardly to occlude the blood flow in the blood vessel. (c) mechanically damaging endothelial cells using a catheter that has been introduced into the blood vessel. 8. The method of claim 1, wherein the step of selecting a target location comprises the step of using ultrasound imaging to select the target location. 9. The method of claim 1, wherein the step of damaging endothelial cells proximate the target location comprises the step of mechanically damaging endothelial cells using a catheter that has been introduced into the blood vessel. 10. The method of claim 1, wherein the step of damaging endothelial cells proximate the target location comprises the step of using ultrasound to damage the endothelial cells. 11. The method of claim 10, wherein the step of using ultrasound to damage the endothelial cells proximate the target location comprises the step of using high-intensity focused ultrasound to damage the endothelial cells via thermal effects. 12. The method of claim 10, wherein the step of using ultrasound to damage the endothelial cells proximate the target location comprises the step of using high-intensity focused ultrasound to damage the endothelial cells via a mechanical effect associated with cavitation. (b) directing a focused beam of ultrasound toward the target location to induce cavitation in the ultrasound activatable agent proximate to the target location, but not in other portions of the blood vessel, the cavitation proximate to the target location causing mechanical damage to the endothelial cells proximate to the target location. 14. The method of claim 13, wherein the step of introducing the ultrasound activatable agent into the blood vessel comprises the step of introducing the ultrasound activatable agent systemically. 15. The method of claim 13, wherein the step of introducing the ultrasound activatable agent into the blood vessel comprises the step of introducing the ultrasound activatable agent proximate the target location. 16. The method of claim 13, wherein the step of directing a focused beam of ultrasound towards the target location comprises the step of using a duty cycle insufficient to induce thermal effects in tissue proximate to the target location. 17. The method of claim 13, wherein the ultrasound activatable agent comprises microbubbles. 18. The method of claim 13, wherein the ultrasound activatable agent comprises an ultrasound contrast agent. 19. The method of claim 1, further comprising the step of introducing a pro-inflammatory agent into the blood vessel after the occlusion has been formed, to enhance the long term stability of the occlusion. (b) damaging endothelial cells proximate to the target location, such that a fibrin clot develops proximate to the damaged endothelial cells, thereby at least partially occluding blood flow in the blood vessel, and wherein the damage to the endothelial cells occurs without damaging adjacent perivascular tissue. 21. The method of claim 20, wherein the fibrin clot is insufficient in size to provide a desired degree of occlusion, further comprising the step of introducing fibrinogen into the blood vessel, such that the fibrinogen is converted to a fibrin proximate to the damaged endothelial cells, thereby enlarging the fibrin clot and occluding blood flow in the blood vessel to a greater degree. 22. The method of claim 21, wherein the step of introducing fibrinogen into the blood vessel comprises the step of introducing the fibrinogen proximate to the target location. 23. The method of claim 21, wherein the step of introducing the fibrinogen into the blood vessel comprises the step of introducing the fibrinogen systemically. 24. The method of claim 20, wherein the step of selecting a target location in the blood vessel comprises the step of selecting a plurality of target locations generally distributed about the circumference of the blood vessel, and wherein the step of damaging endothelial cells proximate the target location comprises the step of damaging endothelial cells at the plurality of target locations generally distributed about the circumference of the blood vessel, such that the fibrin clot expands inwardly to occlude the blood flow in the blood vessel. 25. The method of claim 20, wherein the fibrin clot is insufficient to provide a desired degree of occlusion, further comprising the step of introducing thrombin into the blood vessel, thereby enlarging the fibrin clot and occluding blood flow in the blood vessel to a greater degree. 26. The method of claim 20, wherein the step of damaging endothelial cells proximate to the target location comprises the step of mechanically damaging the endothelial cells using a catheter that has been introduced into the blood vessel. 27. The method of claim 20, wherein the step of damaging the endothelial cells proximate to the target location comprises the step of using high-intensity focused ultrasound to damage the endothelial cells proximate to the target location via a mechanical effect associated with cavitation. (b) directing a focused beam of ultrasound toward the target location, such that cavitation is induced in the ultrasound activatable agent proximate to the target location, but not induced in other portions of the blood vessel, the cavitation proximate to the target location causing mechanical damage to the endothelial cells proximate to the target location. 29. The method of claim 28, wherein the step of introducing the ultrasound activatable agent into the blood vessel comprises the step of introducing the ultrasound activatable agent systemically. 30. The method of claim 28, wherein the step of introducing the ultrasound activatable agent into the blood vessel comprises the step of introducing the ultrasound activatable agent proximate to the target location. 31. The method of claim 28, wherein the step of directing the focused beam of ultrasound towards the target location comprises the step of using a duty cycle that is sufficiently short in time to avoid damaging adjacent perivascular tissue. 32. The method of claim 20, wherein the step of introducing fibrinogen into the blood vessel comprises the step of introducing the fibrinogen proximate to the target location. 33. The method of claim 20, wherein the step of introducing the fibrinogen into the blood vessel comprises the step of introducing the fibrinogen systemically. 34. The method of claim 20, further comprising the step of introducing an inflammatory agent into the blood vessel, to enhance the long term stability of the occlusion.